Have you heard of The Bouqs? If you haven't, you've never seen any florist service quite like this. 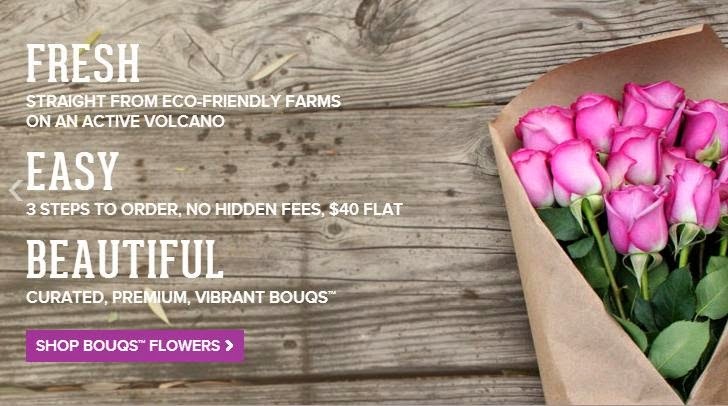 They are an organic florist straight from the Volcanoes of Ecuador. They come a long way in both distance and innovation. I was impressed with what they had to offer. I wanted to get something special for my Mom on Mother's Day and I cannot emphasize enough how picky she is. She doesn't like artsy crafty things. She has very plain taste and she likes things very natural. The bare bones of natural. It took me many years to perfect the art of buying for my mom. When I saw what The Bouqs had, I KNEW that she would be ecstatic with the bouquet of flowers I had planned for her. There were a plethora of beautiful and very unique bouquets to choose from. Anything from rainbow roses to your classic roses, wild flowers and accent flowers. 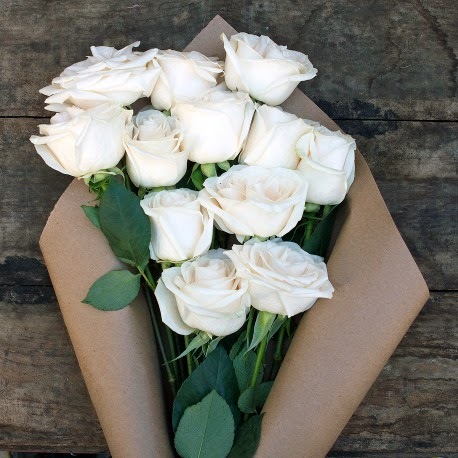 She doesn't like anything like that, but when I saw these spectacular crisp white roses, I HAD to get them. When they finally arrived at her door, the fed ex man joked, asking her who the secret admirer from Ecuador was. "You know these are from Ecuador? Are the flowers not good enough you have to order all the way from Ecuador?" Haha So at this point my mom is wondering what the heck is going on and then she remembered I was sending something. My mom was really excited to open her surprise and I was excited for her, but we didn't know what was in store for us. Be forewarned, this package comes very tight and secure, which is good and bad if you don't have nice scissors and a knife. It was very hard for my mom to infiltrate the confines that held this hope diamond. She even broke her 20 yr old heavy duty scissors trying to pry it open! Haha! Alas, she opened it eventually and then didn't have a knife sharp enough to chop the stems. It was comical really. I was laughing the whole time and so was she. These are as organic as you get, people. No little water baggies to keep the flowers fresh, no flower packets to prolong the life and EVEN the thorns are left on these things! So be very careful with your new flowers. Everything worked out in the end. She chopped away what she could and put them in a vase and she told me that she was BLOWN away by the quality. She said "I've never seen anything like these, they look so fresh and new...nothing like your local florists" She went on to say that they look exactly as shown on the website and have absolutely not a wilt in sight. It has been 4 days and she says they still look as beautiful as the first day, except they are in full bloom and she has never seen such beautiful white roses in person. They cheer her up every time she looks at them. She makes it a point to tell me this every time I talk and e-mail with her. I am very impressed with this florist and would recommend them to anyone who really wants to WOW someone they care about. For $40 you really can't get much better. Give The Bouqs a try!